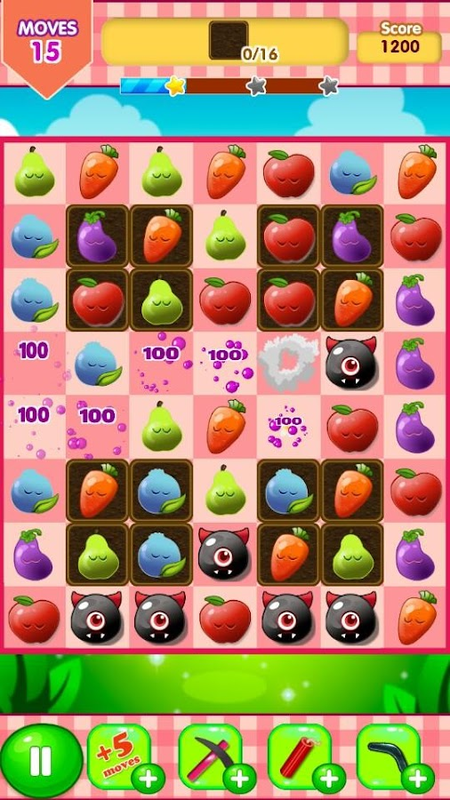 Fruit - Smileys is a match 3 puzzle gamewithnew gameplay. Use three or more identical fruits. Score points and game accessories and try to make more combo. Fun and exciting fruit play! - You can erase only the same fruit that runs continuously. - Various items can remove the fruit. - Ice small items can melt frozen fruits. - Cute, friendly graphics and cool animation effects. 1. Connect three or more fruits. 2. Make the target score or task successful. 4. Quickly removing fruits will give you extra points. 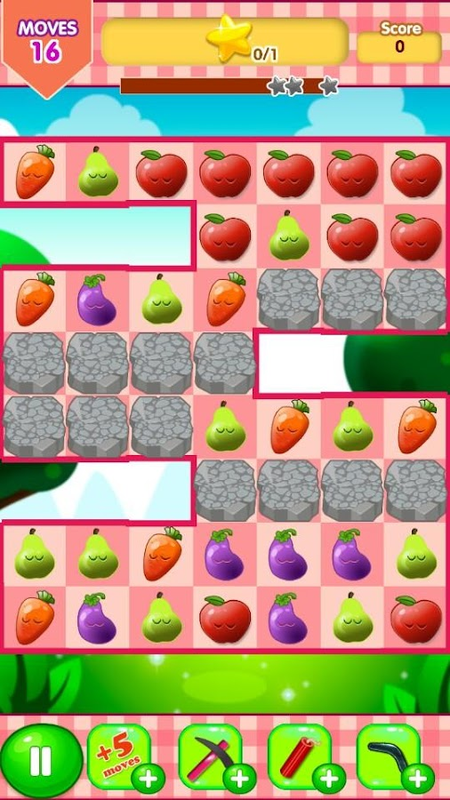 Fruit - Smileys is amatch3 puzzle game with new gameplay. Touch the screen, go through between the obstacles.Bump withobstacles, the game ends.Focus on your hands and eyes. Take as muchas you can. And compare it with a friend. A "R" redbutton in StartScreen is initialize the score. A "Speaker" button in Start Screenmute the sound.A "Stop" button in Start Screen is end the game.Goodluck. Fruit - Smileys is a match 3 puzzle gamewithnew gameplay.Use three or more identical fruits.Score points and game accessories and try to make more combo.Fun and exciting fruit play!Fruit - Smile: Function:- 100 challenging levels- You can erase only the same fruit that runs continuously.- Various items can remove the fruit.- Ice small items can melt frozen fruits.- Cute, friendly graphics and cool animation effects.How to play:1. Connect three or more fruits.2. Make the target score or task successful.3. Raise the level.4. Quickly removing fruits will give you extra points.Have a smiling fruit.----개발자 연락처 :+821050956143Fruit - Smileys is amatch3 puzzle game with new gameplay.Use three or more identical fruits.Score points and game accessories and try to make more combo.Fun and exciting fruit play!Fruit - Smile: Function:- 100 challenging levels- You can erase only the same fruit that runs continuously.- Various items can remove the fruit.- Ice small items can melt frozen fruits.- Cute, friendly graphics and cool animation effects.How to play:1. Connect three or more fruits.2. Make the target score or task successful.3. Raise the level.4. Quickly removing fruits will give you extra points.Have a smiling fruit. 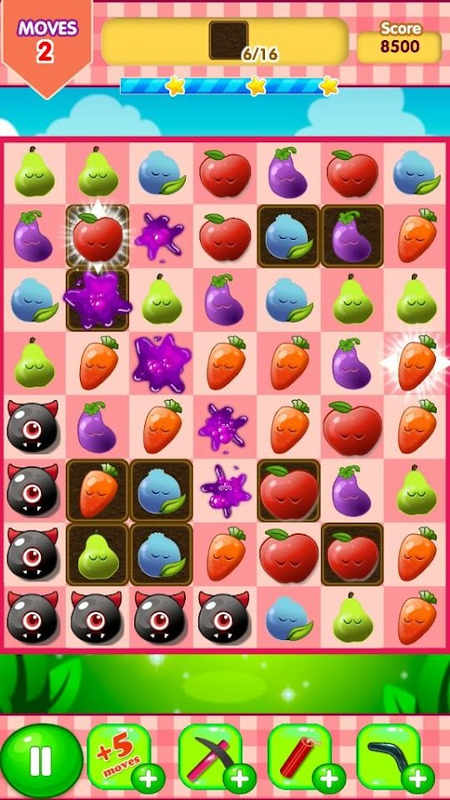 Sweet Fruit Candy is the new super addictive match-3 puzzle gameplay for FREE. It's super fun and easy to play for free onAndroid!Join mission with Poppy the rabbit to collect as many sweetfruits and magical Easter egg to satisfy his sweet tooth. You needto swap and match 3 or more similar fruits in a row. At each levelyou have specific list of goals that need to be completed. Tap themto make them crush and blast.Come hop on to join Poppy’s adventureto unlock the sweet fruit candy wonderland. Unlock boosters tomatch 3 or more for sweet-tooth-licios mega effects. You cancollect free coins for free booster. Features:-Completely free toplay at anytime, anywhere!-More than 200 levels, there's a hugechallenge.-Many sweet and delicious fruits & obstacles.-Cutemusic background. Pause it & play later-Free coins, no need topurchase for super power.-Awesome chain reaction & thousands ofsuperlicious saga levels-Multiple backgrounds graphic to suite yoursweet need!-Best to kill your free time-Best to train your brainand fingers-Suitable for family, including kidsThank you for allthe support. "Sweet Fruit Candy Match 3 or more identical Sweet Fruit CandyConnect Sweet Fruit Candy Link 3 or more Sweet Fruit Candy byputting them on the same line!Get point by erasing Sweet FruitCandy. You can make longer chain of Sweet Fruit Candy to get morepoints!Sweet Fruit Candy link matching How to get 3 stars on everylevel ?Before you Match 3 Sweet Fruit Candy, find the best match.It will take time to understand this, but you will learn afterplaying few levelsHow to play: - Archive the target points to levelup.- Eliminate the more Sweet Fruit Candy quickly can get extrascores.- Sweet Fruit Candy Match 3 or more identical Sweet FruitCandy- Connect three or more same Sweet Fruit Candy to scorepoints." 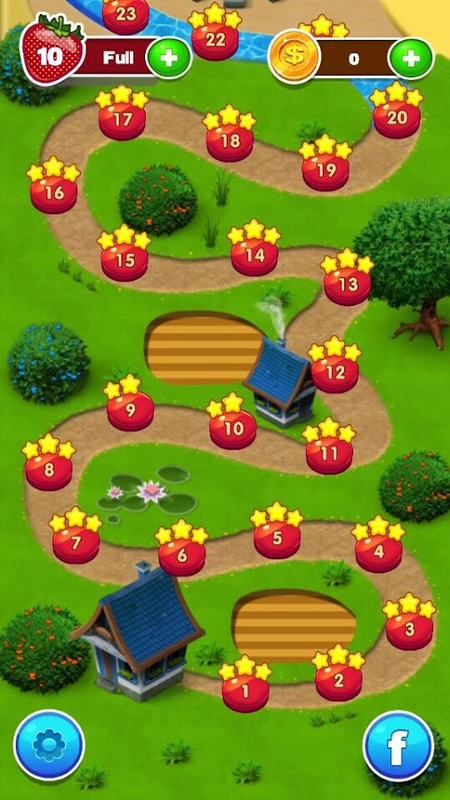 Are you looking for the famous game of jewel match 3 puzzle? TakeCandy Star Blast Mania in this version with more new jewels andsweet candy fruit.The effect interesting jewels lead you to anotherland of jewels star and you can relax with a jewels game. Yourquest will be opened step-by-step. If you are into a diamond puzzlegame and want to waste a lot of time in a funny way, Candy StarBlast Mania will be more than happy to help. 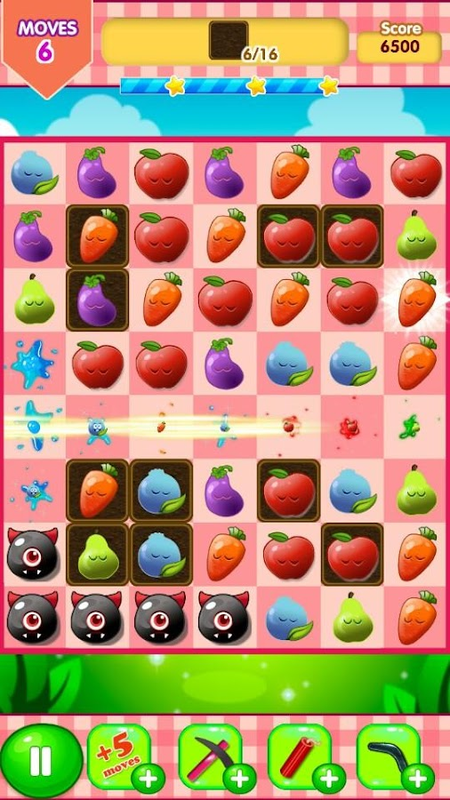 From fresh fruit &candy frenzy and inventive game to magic things of a candy juiceworld, this match-3 puzzle gameplay juice jam brings more fun. Soyou will create perfect way overall experience. Start playingtoday, you look like a fan of puzzle games. Moreover, you canreceive and crush a candy jam on the concept of the diamond world.It’s challenging and relaxing in a jewels saga worldlegend.Download Candy Star Blast Mania and get more versions 2017in your app.